Bonnie Leezie Lindsay / Harry Lauder. 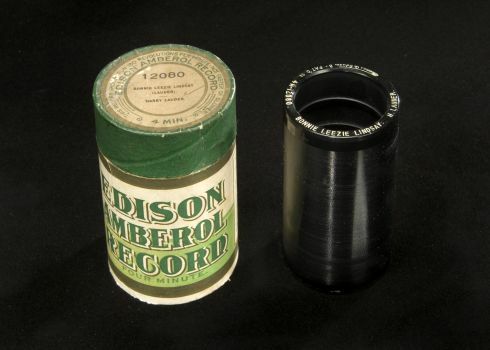 Edison Amberol Record: 12080. 1910. In 1908, Edison introduced the wax Amberol cylinder, boasting double the number of grooves on an equivalently sized wax cylinder and hence a playing time twice as long as that of the Gold-Moulded cylinder. In the coming decade, the four-minute, 200 TPI (threads-per-inch) cylinder would replace the previous industry standard of two-minute, 100 TPI cylinders. (For identification purposes, Edison Amberols, as opposed to Edison Gold-Moulded cylinders, are marked with the "4M" designation, followed by the recording number.) Although this new groove pitch allowed for a wider range of musical and expressive potential, it seems that many of the songs, marches, and vaudeville skits of the earlier cylinder era were simply given a facelift—a new verse here, a verbal or non-musical interlude there—in order to meet the longer time requirements of the new cylinder medium. The machines that had originally been designed to play two-minute cylinders also had to be refitted to accommodate the new groove pitch. The feed screw mechanism found in all acoustic machines of the time allowed the reproducing (playback) stylus to be brought into direct alignment with the cylinder grooves via a fixed feed screw undergirding it. Consequently, these new "4-minute" cylinders would not play back correctly on phonographs designed for "2-minute" cylinders. Edison subsequently manufactured a machine that enabled one to play cylinders of either groove pitch by simply toggling a switch that engaged a stylus designed for 100 or 200 TPI grooves—the Amberola 1A, introduced in 1909. In 1912, though, both the two-minute Gold-Moulded and four-minute Amberol recordings were retired, making way for the final significant recording medium of the cylinder era.